With just a week to go before the branch closes for new adoptions before Christmas we are featuring the lovely Penny who is still searching for her very own loving forever home. 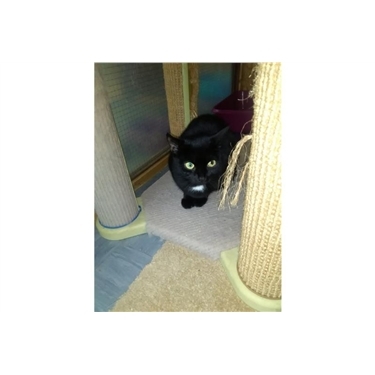 Meet the lovely Penny, she is a short-haired black female, estimated to be approx 18 months old. Penny arrived in our care having been found as a stray, along with her 3 kittens. She had become fearful of people and it has taken her a little while to trust again. She is now becoming an affectionate girl with her fosterer, and fully enjoy the comforts of a nice comfy bed and regular food. Penny will take a while to bond with new people so her new family will need to be patient and spend lots of time with her, so she can learn to trust them. She will need to be started off in one room until she is happy & settled, before being given the full run of the home. She will also need to be fully settled & bonded with her new family before she can start going outside, so this make take a little longer than normal. If you have the time and patience to give Penny we know you will be rewarded with a VERY loving and VERY loyal little friend. Her new home should not have any other cats or dogs. She would also prefer a home where there are no young children, ideally teenagers or older. Penny has been vet-checked, neutered, fully vaccinated and microchipped. Can you make Penny's Christmas wishes come true and offer her a safe loving home where she can have a happy future.